Cook the ground beef in large pot or dutch oven over medium heat, until fully cooked, no longer pink, for about 7 minutes. Drain the grease. Return the pot to the stove. Add the tomato paste, tomato sauce, and beef stock. Stir to combine. Add the seasonings. Cover and simmer over medium heat for the next 10 minutes. 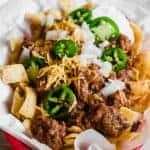 In bowl or plates layer the Frito chips, top with some chili, cheese, onion and any additional toppings.